If your home or office is looking worse for wear and you simply don’t have the time, then it might be time to hire a cleaner. St Leonards residents and business owners can rely on Merit Cleaning for all their residential and commercial cleaning needs. Our team will come to your property and complete a customised cleaning schedule that meets your specific requirements. From bond cleaning at the end of a lease to strata cleaning for building managers, Merit Cleaning will get the job done quickly, cleanly, and quietly. Did you know that a clean office environment has been directly linked to increased productivity in the workplace? If you want to maintain happy, hard-working employees, then you need the best Cleaner St Leonards has to offer. Fortunately, there’s no easier way to clean your office than with our solutions for commercial cleaning. St Leonards office managers can turn to Merit Cleaning for regular or one-off services. We will clean all your surfaces and rooms, from desks to drawers, toilets to sinks, meeting rooms to computer monitors. When it comes to commercial cleaning St Leonards can truly trust, Merit Cleaning stands above the rest. Our team of professionals is fully insured, and each of our cleaners has been police checked for your peace of mind. For short or long-term commercial cleaning without the lock-in contracts, contact our team today. 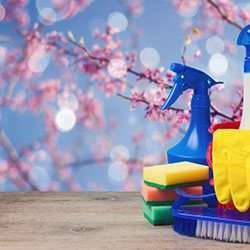 It’s always a good time for a spring clean with the team at Merit Cleaning! We can send a cleaner to your St Leonards home to carry out the largest cleaning tasks or the most meticulous, detailed cleaning work. We will send you a cleaner St Leonards homeowners trust, who will treat and clean your home just like it’s their own! Talk to us to create a customised cleaning plan for your home or ask our experts about our satisfaction guarantee. Choose the residential or commercial cleaning St Leonards knows and loves. Call 1300 063 748 for more information or request a quote online.